Because gold is the best way to celebrate this special birthday, a golden pen from the coolest pop-culture design team in the country will mark a 50th birthday with a flourish. Designed by a co-founder of ultra-hip Acme Studios, and christened the Midas -- as in a touch of gold -- bullet pen, it's guaranteed smooth performance courtesy of its rollerball workings. 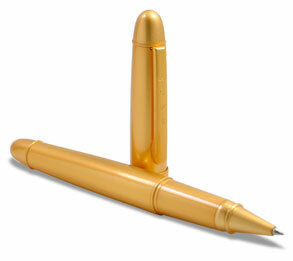 A limited edition of just 550 pens, the Midas bullet measures approximately 5 inches long.